Okay, this is doubly late news. 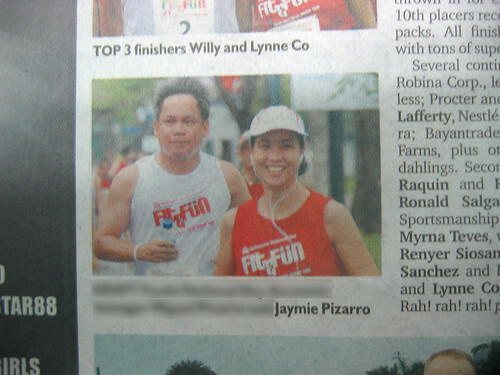 I’m talking about The Robinson’s Fit & Fun Buddy Run that was featured in Maurice Arcache’s Without Batting an Eyelash column last Wednesday, November 5. 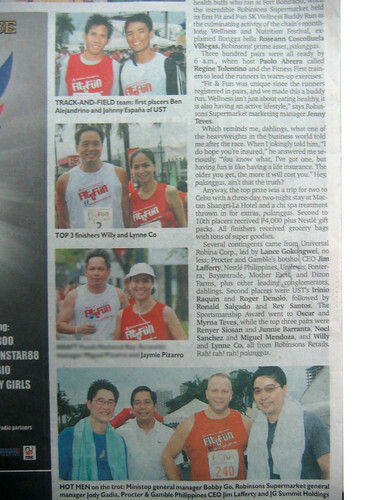 It’s doubly late because we all know that the Buddy Run was held last July 27.
your hubby looks like his really addicteds to running. great run. and no you dont look like you gained weight. Holding hands while running??? Uy intriga!!! Sino! Hey, I wonder where his earphones went. Maybe he just removed them. Before a run, we always agree on either bringing our ipods or leaving them behind. Never just one of us wearing one.